End of tour award, U.S. 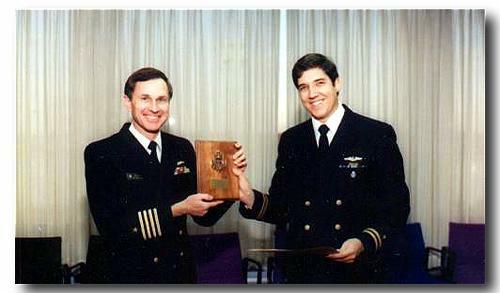 Naval Academy, Annapolis, Maryland, 1988. I was torn - I'd enjoyed the Navy but I wasn't one of its stars. I had done best at teaching and training, but was terrible at navigation - a weird sort of brain mis-wiring causing me to mix up east and west and when under stress, I can't navigate at all. Fine in a classroom, but in a channel, at sea, in the rain, I'm literally lost. It all added to the decision to "punch out" and try my hand at an engineering and construction company. The trouble was, I missed the sea. Two years later, in 1990, I was writing around the clock and in every spare minute, the story I'd imagined that first day on Hammerhead, which I named The Titanium Coffin, but which was renamed Voyage of the Devilfish by publisher Don Fine.